Authors: Katherine Alatalo, Leo Blitz, Lisa M. Young, Timothy A. Davis, Martin Bureau, Laura A Lopez, Michele Cappellari, Nicholas Scott, Kristen L. Shapiro, Alison F. Crocker, Sergio Martin, Maxime Bois, et al. Today’s astrobite deals with an exciting but puzzling observation of a local galaxy, NGC 1266. These observations are exciting because they go against the standard lore of how galaxies form. This particular galaxy has been classified as an S0, a type of galaxy associated with little gas and an old stellar population. Most observers assume that S0 and elliptical galaxies are ‘red and dead’, that is, that they finished forming stars long ago and that the light we see mainly comes from older, low-mass stars that emit redder light than young, massive stars, which tend to dominate the light we see from star-forming galaxies. Recently, however, many studies have begun to find that S0s and ellipticals exhibit a low level of star formation and actually can host a significant amount of gas. This paper is part of the ATLAS3D project, which aims to infer the atomic and molecular gas content as well as the stellar kinematics of a sample of ‘red and dead’ elliptical and S0 galaxies. This particular paper makes use of multiwavelength data that span the electromagnetic spectrum from radio to x-rays. Perhaps most interesting are the submillimeter observations from the IRAM 30m telescope in southern Spain, the CARMA submillimeter array in Owens Valley California, and the SMA array on top of Mauna Kea on the Big Island of Hawaii. 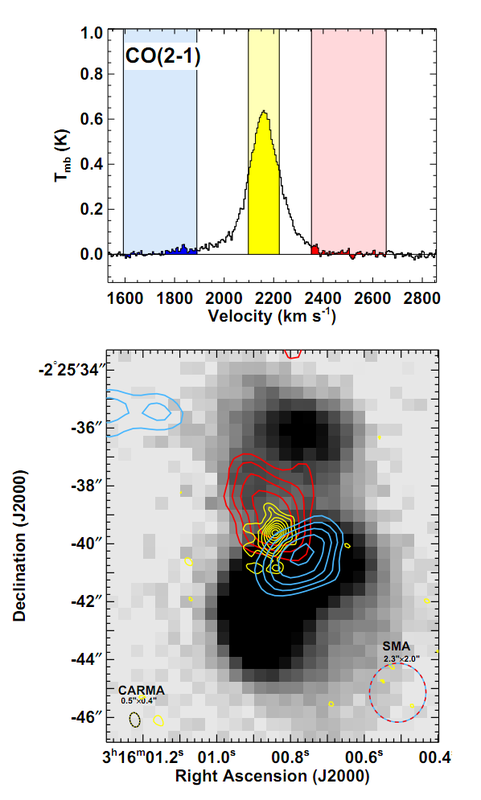 On the left, the molecular line observations are superposed on an r-band image of the galaxy from the SINGS survey. A zoom-in on the molecular emission from the nucleus of the galaxy is presented on the right. 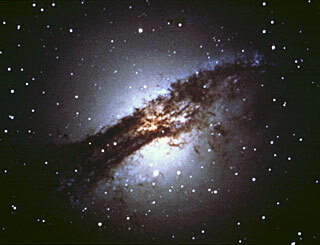 The molecular emission is sharply concentrated toward the center of the galaxy. The submillimeter observations trace the molecular gas content of the galaxy via the first rotational transition of the carbon monoxide molecule. Observers must use CO rather than H2 to trace the molecular gas because H2 does not emit unless the temperature is above a few hundred Kelvin, far higher than the typical temperatures in molecular clouds. The observations show that an enormous amount of molecular gas seems to be piled up in the very center of NGC 1266. This can be seen in the above figure from the paper, which shows the CO emission superposed on an optical image of the galaxy, along with the detailed morphology of the molecular gas. Based on the strength of the CO detections, along with several dynamical arguments, the authors estimate that 4 × 108 solar masses of molecular gas is located within 60 parsecs of the center of the galaxy. For comparison, this is about 100 times more gas than is contained in a typical giant molecular cloud, the largest molecular structure in our own galaxy, which also are around 60 parsecs in radius. Top: The line profile of the CO (J = 2 -> 1) transition as observed by the SMA submillimeter array. The line is separated into a line core (yellow) and the blueshifted and redshited wings of the line (blue and red, respectively). Bottom: The spatial distribution of the gas associated with the velocity components marked in the CO line above. The bright line core is associated with gas in the nucleus, the the wings seem to be associated with a bipolar molecular outflow. The grayscale image shows Hα emission, indicating the sites of star formation and AGN-driven ionization. A closer look at the CO line shows that not only is there a huge amount of molecular gas in the center of this galaxy but that the galaxy also seems to be launching a kiloparsec-scale wind of molecular gas! The authors infer the presence of a wind by the emission detected far away from line center. The wavelength range in which emission is detected in the wings of the CO line correspond to a typical wind velocity of 177 km s-1. At left, I’ve reproduced a figure from the paper that shows the detection and morphology of the wind. The authors estimate that at least 3.3 × 107 solar masses of molecular and atomic gas has been ejected into the wind. A small fraction of the gas has even been accelerated above the escape velocity of the galaxy and will be ejected into the intergalactic medium. What could be powering the outflow of this much gas? The authors estimate that the kinetic energy of the outflow is equivalent to 10,000 supernovae going off at once. However, supernovae are an unlikely driver of a molecular outflow since a supernova would dissociate the molecular gas, leaving behind a primarily atomic or ionized outflow. It’s possible that the radiation pressure from a starburst could accelerate the gas, but infrared star formation indicators find a star formation rate of only ~3 solar masses per year in the nucleus, not enough massive star formation to explain an outflow of 13 solar masses per year. The authors come to the conclusion that an AGN powered by a supermassive black hole must be driving the outflow. Followup x-ray observations from Chandra and archival radio continuum observations from the VLA show a point source at the center of the galactic nucleus, tell-tale signs of an actively accreting black hole. Further work from this group will estimate the properties of the black hole and its relationship to the dense molecular gas in the center of the galaxy.